You know the scenario, you want to sit down and enjoy a cigar but don’t have an hour or so to spare. 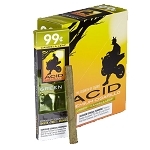 Acid’s got you covered with their Acid Cigarillos, a short and delicious machine made blend, perfect any time of day. 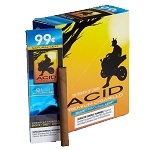 Coming in your choice of 3 varieties, Red, Blue, and Green, expect the full complement of Acid flavors in a petite package. 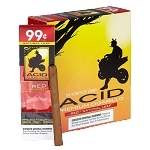 Red: A rich tobacco core is accented by floral and herbal notes with an attractive room note. Blue: Sports a natural wrapper with creamy and strong aromatic qualities resulting from the botanical infusion process. Green: Wrapped in a candela leaf, underlying nuances of earth are overshadowed by aromatic notes sweet cream and vanilla bean.